There are a number of products which you never know exist before you have children yourself but then realise they are a game changer when you do. 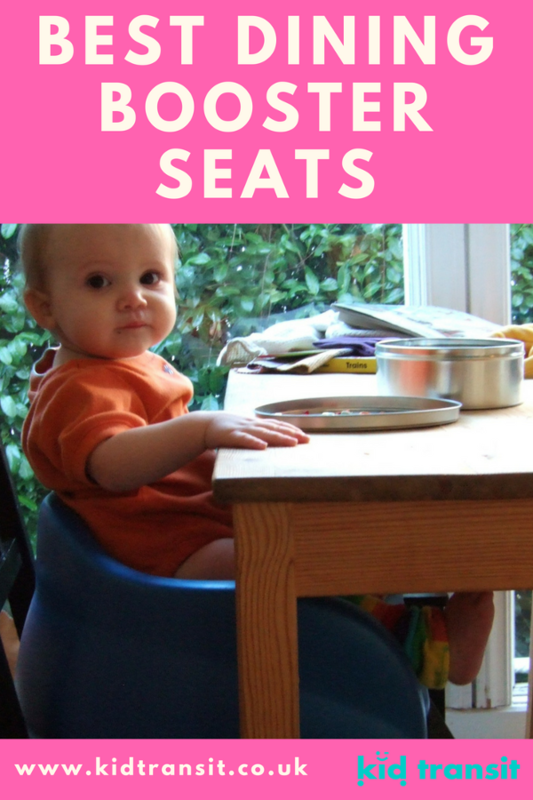 I had some idea of cots, pushchairs, and high chairs, however, when it came to feeding booster seats for dining in and dining out, they were a completely new concept! Luckily, my generous sister-in-law (who has provided us with a lot of great hand-me-downs) had a travel booster seat for eating that she gave to us. What a brilliant bit of travel kit it is! 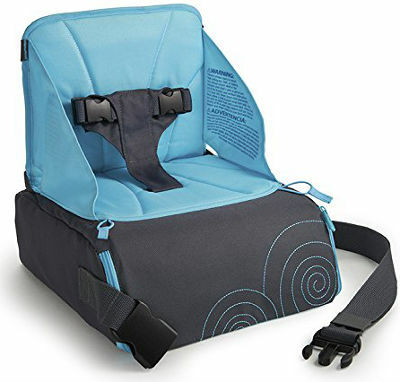 With room to store all the food, wipes, bibs and even drinks for a day out along with providing the much-needed height and straps to keep your little one secure on a normal seat it became something that we took out with us all the time. If we knew we were eating out we took it and if we were visiting friends and family for any length of time (who didn’t have a spare high chair) then we definitely packed it in the car! 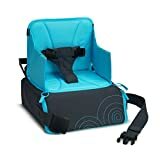 What type of feeding booster seat should I get? 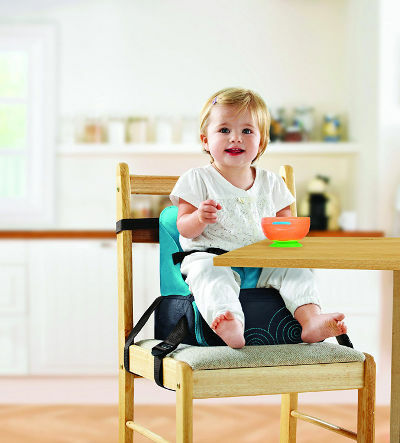 There are a couple of different types of dining booster seat you can get for toddlers depending on what your needs are. The first type is a sturdy, folding design with a food tray like the Flippa from Apramo. The dining booster seat can fix to most chairs and is easy to attach so you can quickly set it up and remove it. The seat has straps to keep your little one secure. The food table is removable which makes it handy depending on your situation and what’s available at the place you are eating at. The feeding chair is lightweight, made from aluminium that is strong but not heavy. 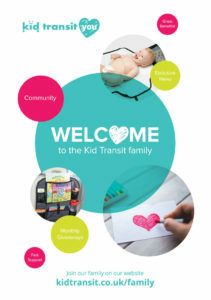 The chair can even be used as a permanent alternative to having a high chair if space is tight at home or you do a lot of travelling, or if your child is cared for at their grandparents (for example) during the week so you are always moving all their equipment from one house to another. Dining Booster suitable from 6 months to approximately 3 years. The type of toddler booster seat we had for the dining table was a more ‘travel’ version. A bit like the Munchkin one (in fact it may have been an earlier version of this one….) The travel dining seat is made of easily washable fabric (great for all those food stains that appear) that covers a sturdy, inner plastic booster which gives stability to the feeding chair. The fabric cover opens out to provide a backrest which attaches around the back of the dining chair you’ve placed it on. Other straps attach to the bottom of the chair making it sturdy and stable. The straps for the seat turn into a handy over shoulder carry handle so you can pack it up and sling it over your arm when you’re ready to leave. 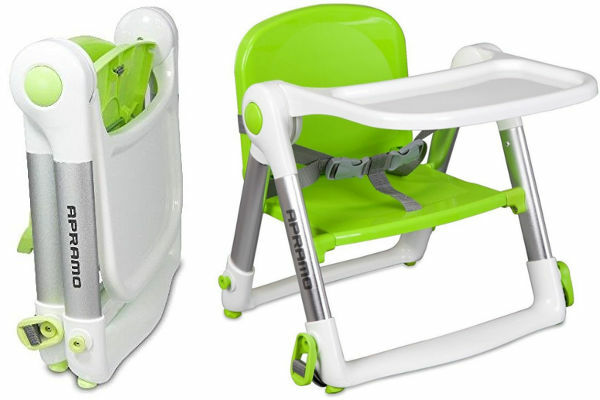 The seat has a lap strap for your little one so can’t be used for babies who still have difficulty sitting up properly. There isn’t a lap tray on this one as it’s designed for lightweight travel use. We never found this to be a problem as we always used it with a dining table in front. The advantage of this one is the extra storage for things. The Munchkin one has a big pocket for food, wipes, cutlery etc and even some small pockets for tissues or a spare dummy. 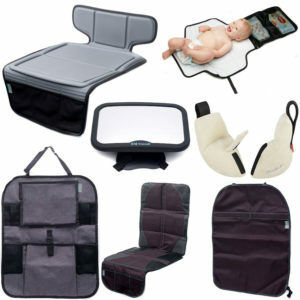 If you take this out with a Kid Transit travel changing mat then you don’t need to take your bulky nappy bag at all! Is a dining booster seat for you? We found the travel booster seat really useful for quite a while. We go out fairly often to cafes or other places to eat and often visit friends and family on the weekend. The travel booster seat meant we could easily set it up at the table without having the faff of needing to locate, then move a sometimes large and heavy highchair into position. When you eat out, a lot of smaller places don’t always have a highchair available or only have one that might already be in use. We also used the booster chair when our daughter was getting too big for a highchair but we still wanted her to stay in one place during the meal! The booster seat came in most useful though when stopping with family for a few days. It meant we could all have a meal around the table without my daughter running off or having to sit her on my knee to eat. We definitely wouldn’t have been without our hand-me-down!